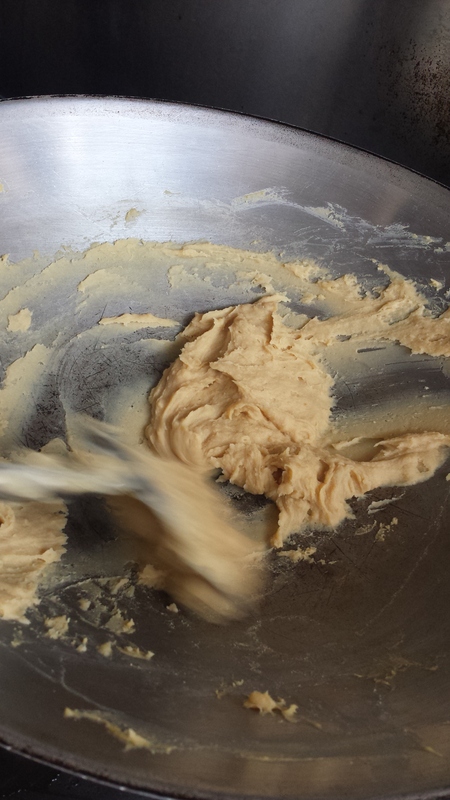 It’s Mooncake Time – Let’s make Lotus Paste! Today I did something I never thought I would do. 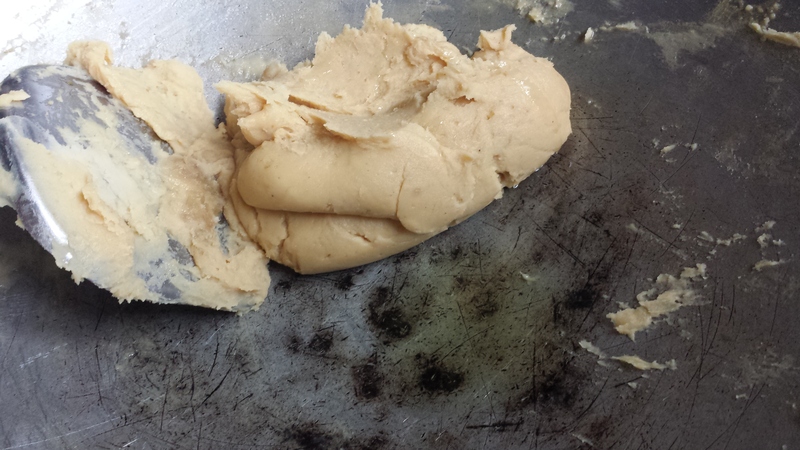 I made Lotus Paste from scratch because I have a private class coming up and my student wants to learn it from scratch as the country she comes from, well, they don’t sell it like they do here. So I trotted off to the market and bought all of Ah Leng’s 300 gm Lotus Seeds, while she looked at me suspiciously like I didn’t know what I was getting into or what I was buying. “This is for mooncake cake,” she exclaimed. I nodded my head, because I was looking at the newly opened box of Russet Potatoes. “You better ask your mummy,” she went on. I gave her the look and her staff laughed. Then she went on to tell them how I bought the wrong things once long ago and was asked to return it and she didn’t want to take it back and my mum came and told her off. She took back the stuff after that. I was 8. This is what I hate about going to the market over here because they all know me since I was a kid and the still think I am a kid. Ah Leng still thinks the 25 salted eggs bought last year was for my mums Mooncakes. Now what rot is that? Mum can’t even make a Mooncake! 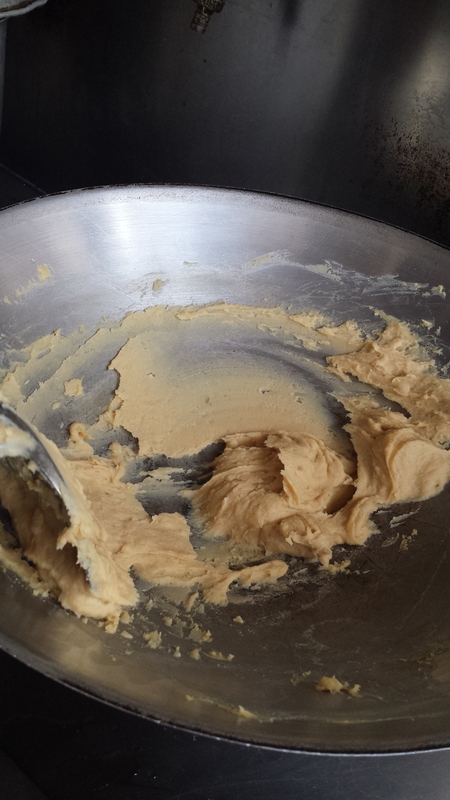 Anyhow, back to Lotus Paste Preparation. Now be warned, this is hard work. I have the aching right arm now to prove it. 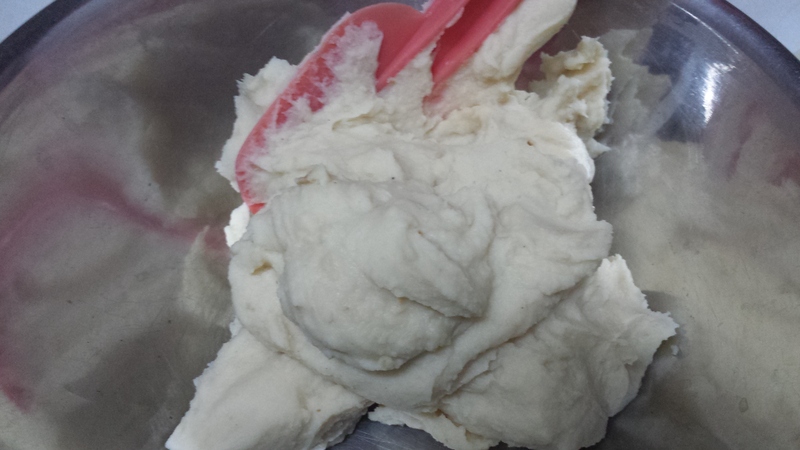 So here is my simple recipe for basic Lotus Paste. 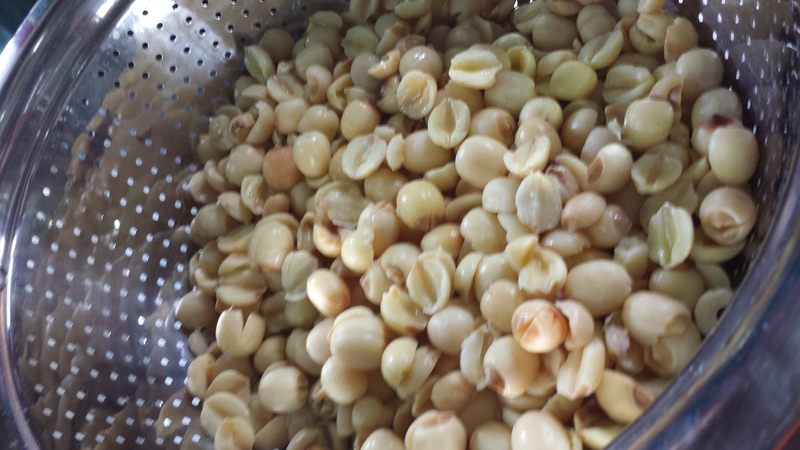 I bought skinless Lotus Seeds because I could not be bothered having to crack them opened but I am told the ones with the skin is tastier. So here goes my method in Photos. 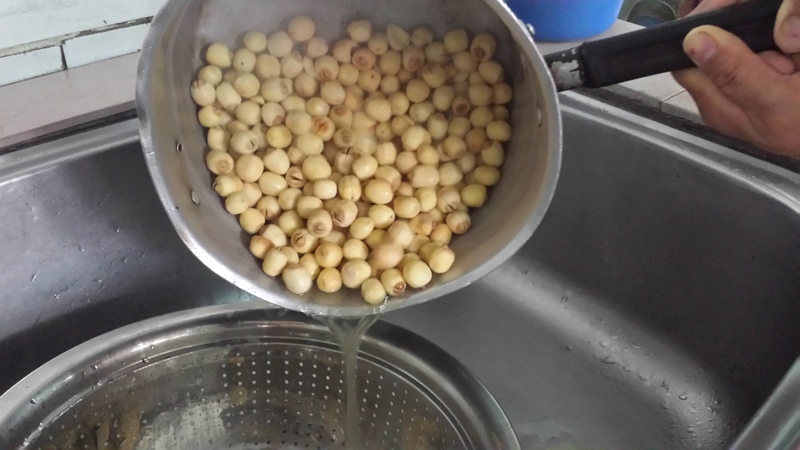 Boil the lotus seeds for about 10 to 15 minutes. Please do not look down on my pot. This pot has been around since I was single digits and it was a second hand pot as well bought from some expat. Serves me well and is the best compared to my Royal Doulton and all. Once it is time. 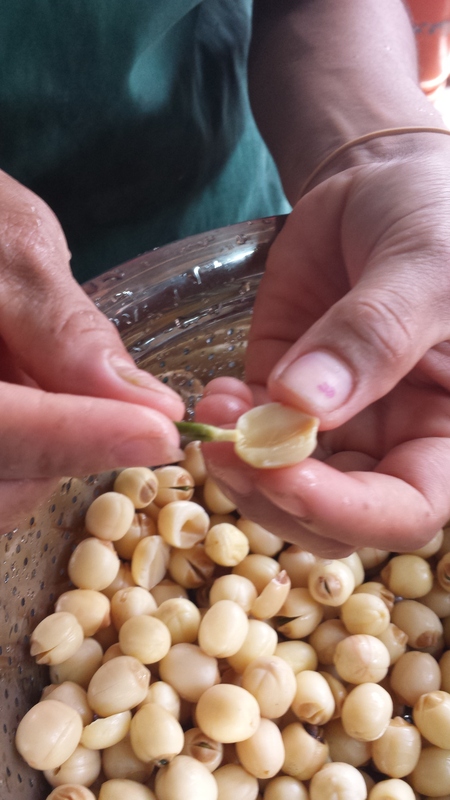 Notice the seeds are still whole. This is where the fun begins. Cool the seeds down under running water and leave to drain properly. Next job requires nimble fingers. Thank God for Yus nimble fingers. You have to remove this little green shoots because it is rather bitter. I know.. I tried it just to see if this was true. Very Bitter! Quite pretty in the orange basket. So once this is done. 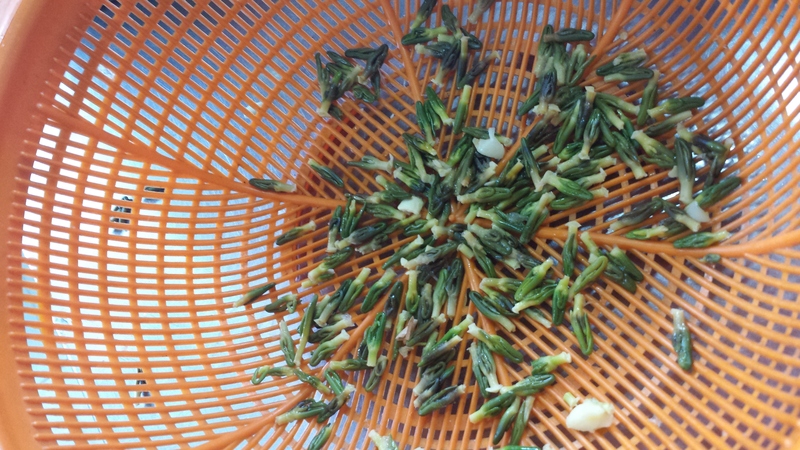 We boil the seeds again for about 45 minutes to an hour. Do check for softness. Some of my seeds were softer then the other so you need to check this properly. Often a time I would pick up something really soft and next minute Yus would pick up something hard. So do check as food processing it might be a problem. Drain and leave to cool for about 1/2 hour. Food Process the seeds little by little. I used my Vitamix and it made such strange sounds and even had a burning rubber smell so I stopped. Next time Food Processor. Make sure it is fine or not you will have to run it through a sieve and that will be messy plus a pain in the you know where. 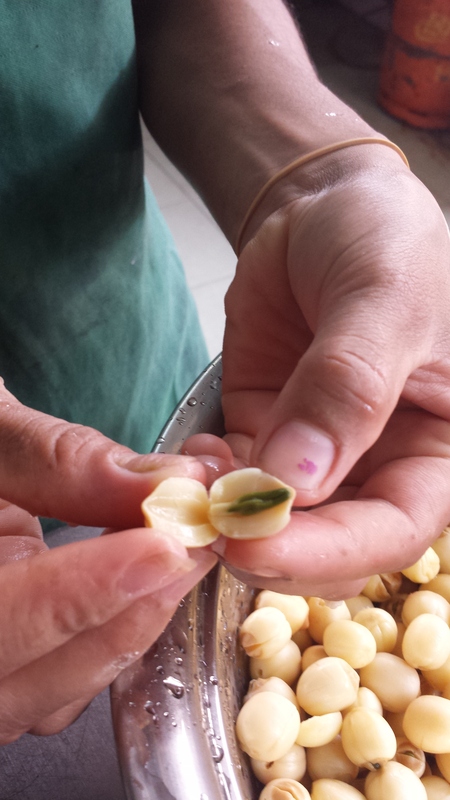 So here is the food processed Lotus Seeds. Yus had to use her hands to remove the rest as the Vitamix is rather narrow. Real messy job I have to say. 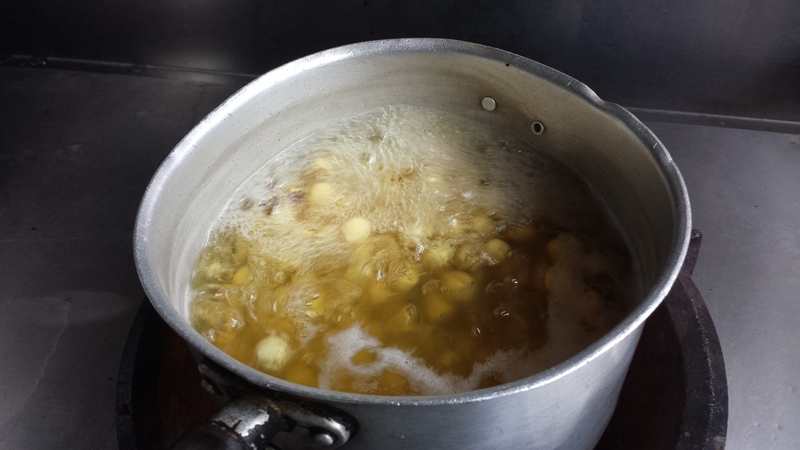 Now we start to cook the paste. Heat the oil on low flame. 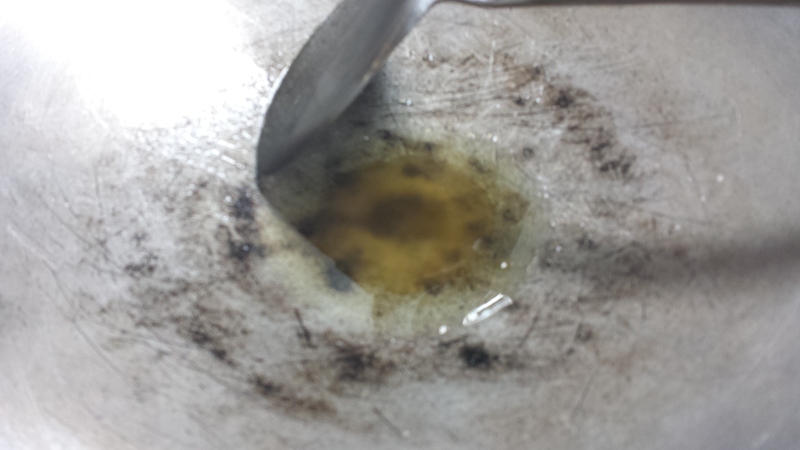 I only used a single flame Use only a bit of the oil. Add in 1/3 cup or so of the sugar once the oil is slightly hot. Start stirring rather quickly and ensure it does not burn too quickly. Fire has to be really small if you are a first timer. Now even this might be a tad bit dark for some but I decided to go ahead and add in the paste as it was not burning nor emitting any burnt smell. Add in the sugar as well and make sure you stir it through properly. 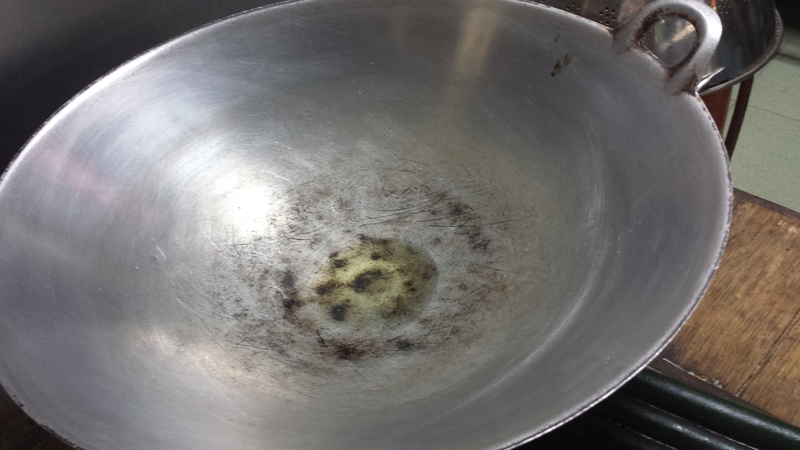 Hold the pan at all times when you are stirring as the wok or pot will move as well. 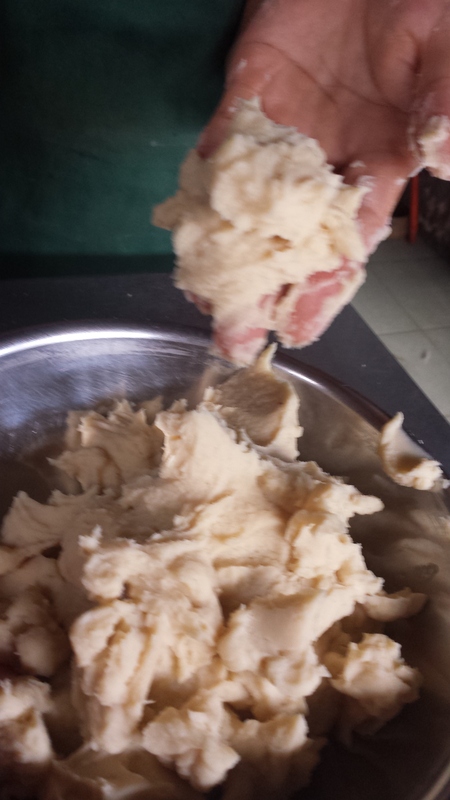 This is the hard part of preparing the paste. Use a spatula to scrape the sides from time to time. Stir non stop till it thickens. 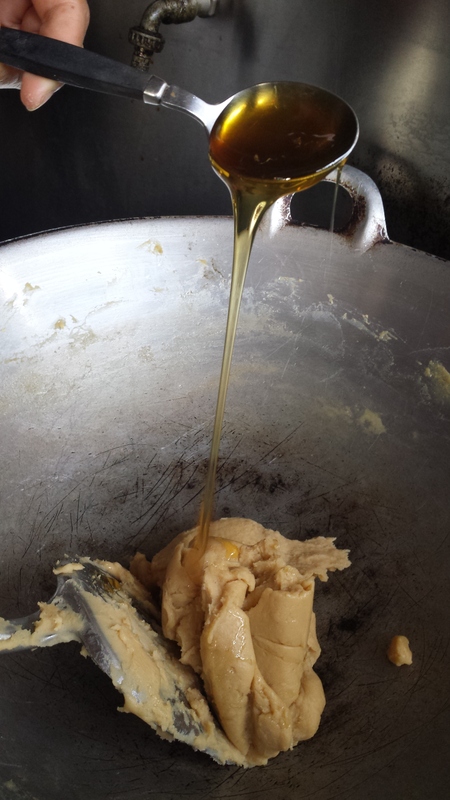 Then add in the oil little by little in perhaps four to five batches. 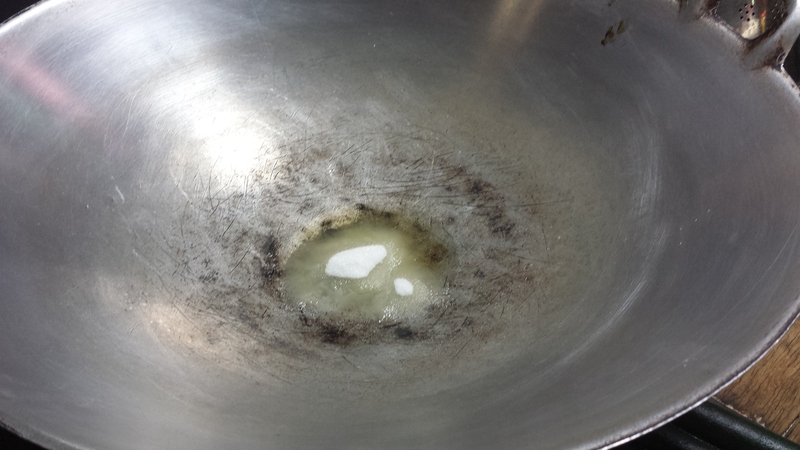 Please notice there is a bit of oil at the bottom of the pan. 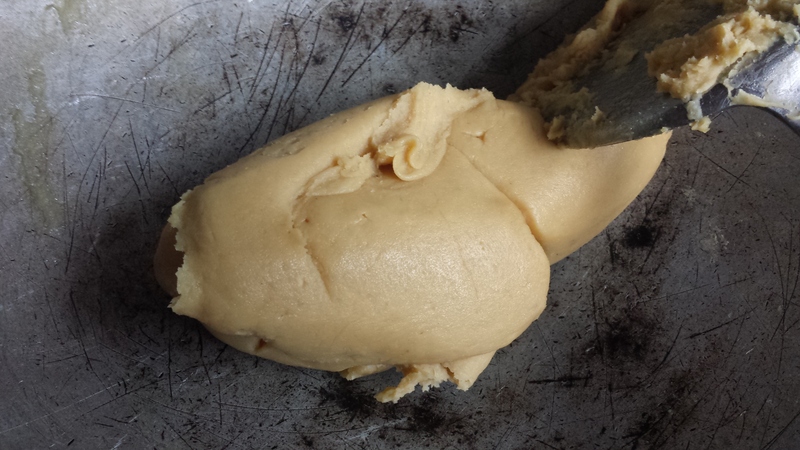 Pour in this amount four or five times once the paste becomes like this. 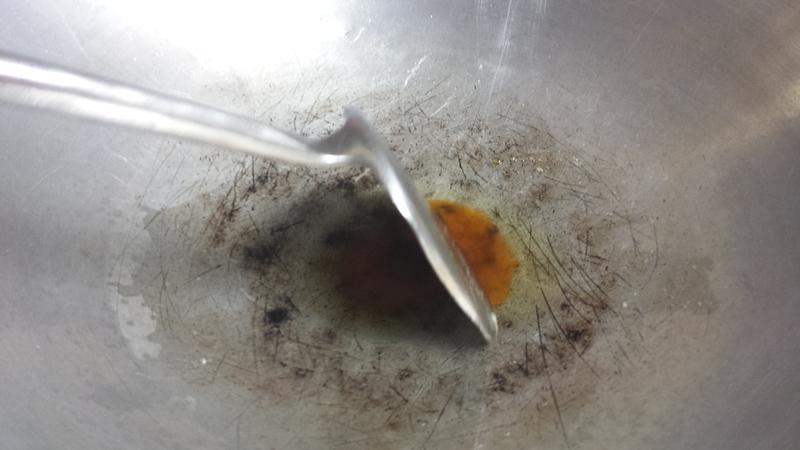 Stir till the oil is well mixed and becomes a lump again. 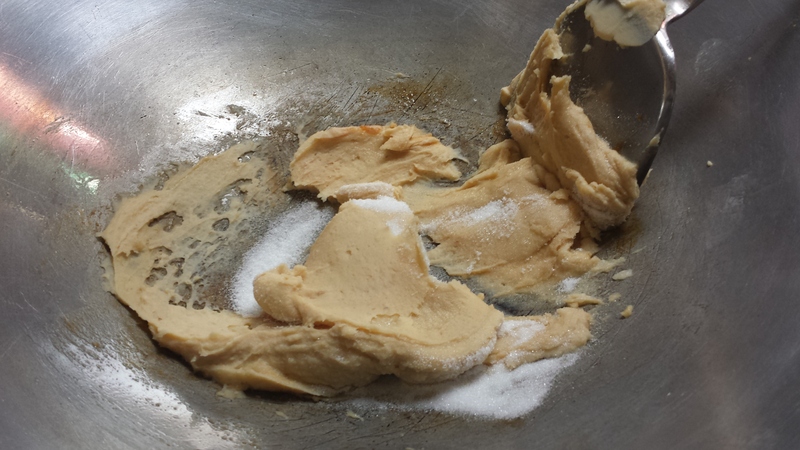 Once the oil is well mixed, add in the Maltose. Stir this till it is well mixed. Make sure there are no bits of maltose within the paste. Carry on stirring till the paste becomes a dough and doesn’t stick very much. Don’t forget to use a scrapper from time to time to clean the sides. This took roughly about an hour and a bit. Note too I have a steady flame to work with. Stirring all the time is a pain, thank God Yus was around to help me with the photo bits. Do not rush to do this and never do it over a big flame. I left it to cool and wrapped it up with cling wrap. Let’s see if I am in the mood to try Pandan Lotus Paste next. Happy Cooking and don’t say I didn’t warn you!